Hi Guys and Gals, this is our first blog so be nice. This is a rather tall hedge we do in the Eltham area. As you can see, it’s around a pool so access is rather limited. We would normally use a large A-Frame ladder and Trestle set up, but instead we are able to access the hedge by gaining access to the neighbours back yard. 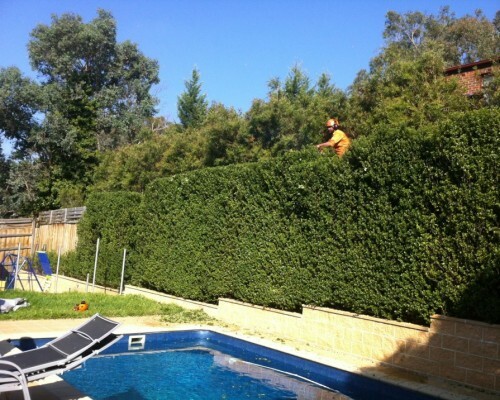 The picture isn’t a finished product yet, but this is what a Pittosporum hedge can look like with regular hedging. This entry was posted in Landscaping Ideas on April 20, 2013 by H Create.